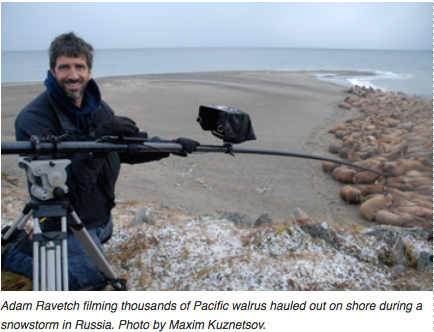 Chris Palmer reveals the secrets of wildlife documentaries. 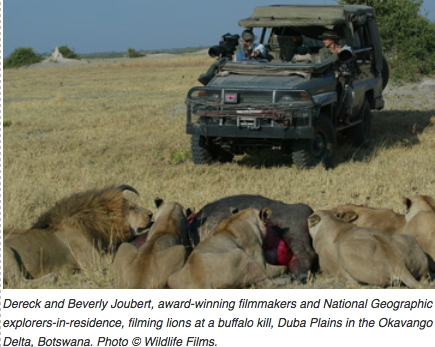 Laurel Neme's interview with wildlife filmmaker Chris Palmer aired originally aired November 15, 2010. The interview was conducted by both Laurel Neme and “The WildLife’s intern, Ben Kennedy. It was transcribed by Ben Kennedy, who also wrote this introduction. Classic animal series like Shark Week hosted by the Discovery Channel and Wild America by Marty Stouffer have captivated audiences for years, bringing them closer than ever to nature from the comfort of their living room. Unfortunately what the audience doesn’t know is that many of those wildlife films incorporate unethical behavior including animal harassment, staged scenes, and the use of trained animals. 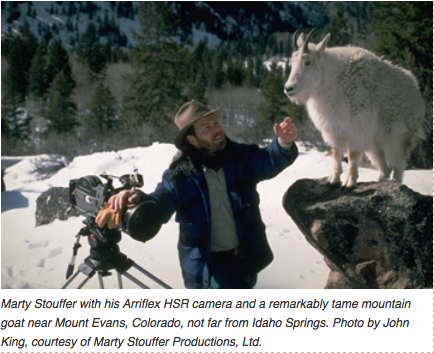 These claims come from Chris Palmer, a veteran wildlife filmmaker with over 300 hours of original programming for prime time television and the giant screen, director of the Center for Environmental Filmmaking at American University and author of Shooting in the Wild: An Insider’s Account of Making Movies in the Animal Kingdom (Sierra Club Books, 2010). Palmer concedes that his films have used these unethical techniques and that significant proportion of the wildlife programming we find ourselves enthralled with is as fake and scripted as any Hollywood movie. This led Palmer to television. In 1982, Palmer pitched an idea to Ted Turner, which turned into a partnership between TBS Superstation and the National Audubon Society. He became a producer, hiring writers, cinematographers, photographers, researchers and so forth to develop a new line of nature programs. The Hong-Kong born, English-raised Palmer attended University College London where he earned a BS in Mechanical Engineering and an MS in Oceanic Engineering and Naval Architecture, and a second master’s degree in Public Administration from Harvard University where he was a Kennedy Scholar. In the 20 years before becoming a film producer, he was a naval officer, an engineer, a business consultant, an energy analyst, chief energy advisor to a senior U.S. senator, a political appointee in President Jimmy Carter’s Environmental Protection Agency, and an environmental activist. 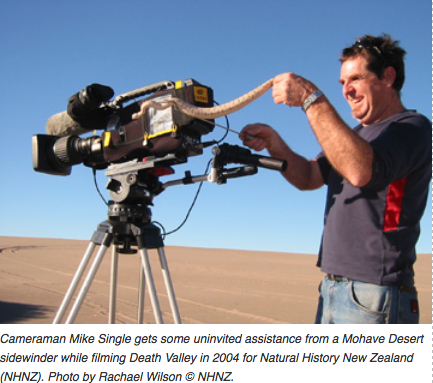 “My goal has always been to use television to promote conservation,” he insists “and to use television to change public policy” but concedes that is not the goal of all wildlife filmmakers. Often times their goal is to get high ratings beyond all else and this sometimes leads to a desire to get certain shots of an animal acting in a specific way, which can lead to staging phony scenes. Regardless of the goals of others, Palmer has had a lasting affect on conservation and his contribution hasn’t gone unnoticed. In 1994 the Frank G. Wells Award from the Environmental Media Association honored Palmer for his efforts promoting conservation year after year. The lack of ethical filmmaking in the industry has led Palmer to found the Center for Environmental Filmmaking at American University. Its main purpose is to educate the next generation of filmmakers as to how to produce these movies without harassing animals, endangering lives or deceiving audiences. Classes teach students to do everything from learn the corporate production side of things, to making trips to Florida and Alaska to learn ethical filming in the field. Palmer’s motivation for whistle-blowing is simple: he’s become increasingly haunted by animal harassment during filming, the deceptions of the audience, and the lack of conservation in the films. 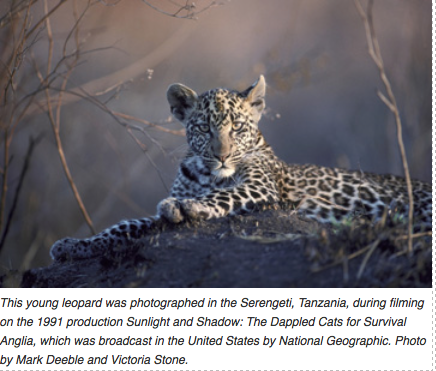 Laurel Neme: How did you first get involved in wildlife filmmaking? Chris Palmer: I got started in this business because I got frustrated as a lobbyist. I was a lobbyist for the National Audubon Society and I went up to Capitol Hill and would lobby for clean energy, renewables, reform of natural gas pricing, things like this … and I began to question my effectiveness. I was in my young thirties and I thought … maybe what I should do instead is try and find some way to influence the people who elect our legislators in the first place, rather than try and influence them once they got there. That led me to think about television. About the same time (about 1982), Ted Turner was beginning to look for new programming for his TBS Superstation. … and after some discussions Ted and I formed a partnership between TBS and the National Audubon Society. That's what got me into environmental conservation television programming. Laurel Neme: For you, given your background in conservation, what is the purpose of wildlife films? Chris Palmer: Their job is to promote conservation. That isn't as simple as it sounds. A lot of people will say "No, that’s not their job." But that’s what I say. … When I changed from being a lobbyist to being a TV producer, some people, like my parents, thought I'd changed jobs. But I hadn't at all. I just changed the tools I was using to achieve conservation. … My goal has always been to use television to promote conservation—not only to build awareness but to help bring people to action so that they'll change their behavior or help influence public policy. … [However,] I'm not claiming that as the purpose that everybody else has when they make these films. Laurel Neme: Some would argue the job of these films is to foster appreciation of wildlife, and that that appreciation will lead to action. What are your thoughts? Chris Palmer: In fact, there is a lot of debate about this. I've changed my mind a couple of times. When I first started, that’s what I thought. I thought there was a direct linkage between ratings and conservation—in other words, the higher the rating, the greater the impact on conservation. I've come now to think that's a naive view, and that ratings are just one metric, and maybe not a very good one, of the conservation impact. There obviously is a link between conservation and ratings because if you get a zero rating, nobody is watching, so you can't achieve anything. But it's also true to say a higher rating doesn't necessarily mean you have a high conservation impact. For example, Blue Planet had a very high rating but did not have a high conservation impact. Laurel Neme: So you’re saying there’s a spectrum of perspectives and we need films for that whole range along the spectrum. Laurel Neme: In your book, Shooting in the Wild, you ask whether money spent on these films would be better spent on conservation. What do you think? Laurel Neme: How do you balance influence from advertisers or donors with honest reporting? Chris Palmer: The question of money and influence on content is an important one, and something that we're generally not sensitive enough to. These films can only be made with money, and where that money comes from has a big influence on what type of film you make. If you get money from a commercial company, that company is going to want to see that its mission is furthered by the film. The money can come in various forms, such as sponsorship or direct investments or a gift, and … you try and keep the corporation out of the editorial content of the film…because it could destroy the credibility of the film. [For example,] in the environmental business, if you have Exxon Mobil sponsoring a film on conservation, nobody is going to believe it. So, you have to be very careful how you pitch your sponsors or investors. Money can come from a bunch of different sources, such as corporations, foundations, wealthy individuals and so on. The less strings attached, obviously the better. But anyone who says that sponsorship money doesn't influence the content is not telling the truth. There is a link there. For example, there was an IMAX film made about gold. There was nothing wrong with the film. It was a fine film. It was full of the wonders of gold: what an extraordinary material it is; how gorgeous the necklaces are; all these things you could do with it; the power of it. [There was] nothing in the film about the violent and disgraceful environmental impact of gold mining: the pollution from it; all the terrible things that happen when you mine gold; the sickening aspects of gold mining on these environments. There was nothing in the film about that. Well, why not? Surprise, surprise! The film was sponsored by gold mining companies. So, I think you always have to look at these films and see who is funding them, and check if there’s an influence going on which destroys the validity of the film. Laurel Neme: Under Ted Turner’s leadership, was that less of an issue? Chris Palmer: Yes, it was, but only because he would stand up. [For example, with the film] “Rage over Trees,” which is about clear cutting, the logging industry was so upset that they boycotted the film and Turner, and forced all the advertisers off the program as well as our sponsor, Stroh Brewery. We lost huge amounts of money. But Ted broadcast the film anyway. And later on, we got other funders to come back in. We did another film about overgrazing, and this time the ranching industry came after us and boycotted TBS and Audubon. And, again, we lost money. But the thing about having someone like Ted in your corner, [is that] he’s fearless and he doesn't mind losing money if it’s the right thing to do. He thought the films were great. He thought they had a good message. He thought it was important for people to know that clearcutting and overgrazing were not good things. He was not going to be pushed around by the ranching industry or the logging industry, and he broadcast [the films] anyway. Laurel Neme: When Ted Turner’s company was bought out by Time Warner, and later in 2006 when he was essentially forced to step down as Vice-Chairman of Time Warner, what was the impact of that shift? Chris Palmer: We lost our programming. The influence was huge for us. … It meant he couldn't put on the type of environmental programming [done by] National Audubon and others like the Cousteau Society and National Geographic. … Other people took over the programming decisions from him. Laurel Neme: In your book, Shooting in the Wild, you say that what makes many nature documentaries so engaging is the sheer wonder of seeing those animals wild. But you also relate how many of those scenes are often staged. Chris Palmer: Yes. 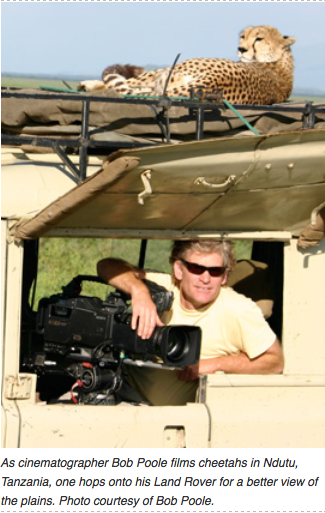 The reason I wrote my book, Shooting in the Wild, is because, after over thirty years of making films, I've become increasingly haunted by some things that really bothered me: animal harassment during filming; the deceptions of the audience, and the lack of conservation in the films. I wrote my book to draw attention to them. Some of the animals we see in these films are not wild. They are controlled. They may be wild but they are controlled and captive and some of them are trained. [For example,] if you see a close-up of a bear standing on its hind legs with its mouth open and roaring, it almost certainly was acting. Behind the camera is a trainer giving signals, using m&m's and jelly beans to train it, and rewarding it with food to do certain things, like open its mouth and roar to look menacing. It’s just an act. People get taken in by this. When people find out that the animals they are looking at are not…wild and free-roaming, yet the film is giving the impression they are, they feel cheated. I think this is a problem. The other thing is these animals often come from game farms, which, as I talk about in my book, are very stressful places for animals and not good places for animals to be—especially big charismatic animals like bears, wolves, wolverines and lynx. These sorts of animals are kept in small cages. Then, when people like me come along and want to make films, or still photographers who want to make pretty calendars with pictures of animals, they rent these animals, take them out so that they look like they are free-roaming and wild when they're not. So there’s an animal welfare component to this as well as audience deception. Laurel Neme: What are some examples of how you have used captive animals? Chris Palmer: In our “Wolves” IMAX film, [which I made] before I really understood game farms, I rented wolves for that film because we wanted to get closer to the wolves. We couldn't get close-ups of the wolves in the wild. Wolves don't like to be around people. They will move away, and they will move 50 miles a day. So trying to get an IMAX camera close to wild wolves is virtually impossible. In Yellowstone, or the Yukon, for example, it was just impossible. The only way to get close-up of wolves and bears is to rent them out, and that’s what I did when I made our “Wolves” IMAX film. Another example is from our IMAX movie “Whales.” We have a scene where you see the skull of a killer whale at the bottom of the sea to illustrate one of the dangers to migrating humpback whales. Killer whales are one of the main obstacles [humpbacks] have to overcome as they take on their 3,000 mile journey from their breeding grounds in Hawaii to their feeding grounds in Alaska. So we show a killer whale skull. But we put the skull there. The audience thinks it was there naturally on the sea bottom. But we actually put it there. I'm afraid that manipulation and staging is fairly routine in wildlife films, and that’s why my book, Shooting in the Wild, has become controversial. People inside don't want their trade secrets to be given away, and yet people on the outside are just delighted that someone is talking about this. Ben Kennedy: Why do filmmakers take all these shortcuts? Chris Palmer: The reason they take these shortcuts is to save money. Budgets are very tight nowadays. 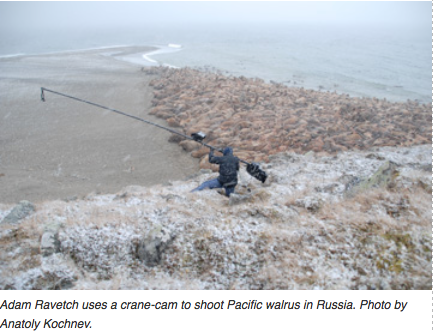 The time is over where people can go out for four to five months to get footage of extraordinary animal behavior. Occasionally that does happen, for example, when the BBC, which has a very big budget, makes a series like Planet Earth and Life, they’ll spend $2 million an hour. So they can afford to send people out into the Himalayas to get pictures of snow leopards and so on. 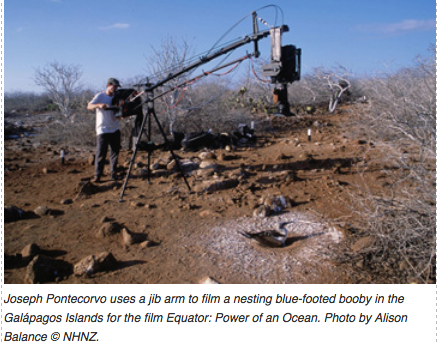 But for most wildlife filmmakers you don't have three or four months. You’re lucky to have three days. To get footage and to get “money shots” in three days, so that you get hired again and so that the executive producer of the network is pleased with your work, you have to find shortcuts. That’s why people do this. They’re forced by the situation—the shortage of time, shortage of money—to do whatever it takes to get the shot. That often means fabricating it. Ben Kennedy: Do you think there are positive aspects to these deceptions? Chris Palmer: There are some positive aspects. This subject is not totally black and white. One positive aspect of these deceptions is that, when you use wolves from a game farm, that means you’re not disturbing or habituating wild wolves, which is good. You're using animals that are already habituated. You’re not messing around with wild animals. Generally the best rule is to stay away from wild animals. They ought to be left alone—use a long lens, don’t get in their face, don’t get in their personal space. This is my problem with people like the late Steve Irwin and Jeff Corwin and Bear Grylls. All decent human beings. They’re all good people. But my problem with them is that, for the sake of ratings, they insist on getting into the personal space of animals like reptiles and snakes. Remember how the late Steve Irwin used to jump on crocodiles and pick up snakes. I just think we need to be more aware of animal welfare in this situation. And to harass animals and goad them for the sake of ratings and for the sake of money, I just don't see any justification for that. There are situations where it could be defensible but too often we bother them just for the sake of entertainment. I'd like to see much less of that. Laurel Neme: Can you name some particularly unethical examples of harassment of animals just for the sake of entertainment? Chris Palmer: I can give you one with Bear Grylls. There is a clip on YouTube now of him jumping into a small stream, about 10 feet wide, and grabbing a monitor lizard, with sharp claws. He holds it up by the tail, discusses it, shows its claws, and then he holds it by the tail and swings it as hard as he can against a tree to kill it. [Then he] gets his knife out and plunges it into the back of the neck of the monitor lizard to kill it. To be fair, if there was an Animal Planet executive on the phone, (by the way, they’re all very good people) they would say "…that’s not an environmental film. That’s a survivalist film." But I think that’s a distinction made by executives and networks. It’s not a distinction made by ordinary, regular people. And I don’t think killing an animal for the sake of ratings is a good thing. I know Animal Planet and Discovery will say "This is totally unfair of you. This film with Bear Grylls is about survival, and people’s lives have been saved by the things they've learned on his show." I would respond to that [by saying] "How many people’s lives have been endangered by them trying to imitate him doing ridiculous stunts." Laurel Neme: What about this phenomenon of people imitating the hosts? Chris Palmer: It's a real problem. When Steve Irwin got into the personal space of reptiles, picked up snakes and jumped on crocodiles and so on, if people didn't try to copy him, there would be less of a concern. But young impressionable people, people who have a heavy diet of these programs, of watching intrusive on-camera hosts, they will watch the Jeff Corwins and Steve Irwins of the world and say "Gosh, I'd like to do that." They go out to Yellowstone [National Park] and walk up to elk, thinking its safe to do so, and don’t realize the harassment and disturbance they’re causing the animals, let alone the danger they’re putting their own lives into. That’s why we often see in Yellowstone and Yosemite people walking up to bears and thinking they're safe. There is so much ignorance about the natural world. These animals, when you bother them, they become dangerous and scared and will lash out. Every year some people get killed by bears. It’s always the fault of the people, never the fault of the bears. People are dying to get that close-up shot. I criticize these intrusive on-camera hosts, like the late Steve Irwin, because of the bad example they set. I also, by the way, praise them for their conservation work. They’re good people and mean well. It’s just that in their pursuit of ratings they want to get too close to animals and that is not good. Laurel Neme: Why are these issues so problematic? What’s the harm of staging fake scenes? Chris Palmer: For example, a scene you can find in films is of a snake climbing a tree. It goes up a tree and then the next thing you see is the camera on the ground looking up and the snake falling down on it. A naive viewer will think "the snake’s just fallen out of the tree because it was chased out of the tree by an angry bird defending its nest.” But what’s happened is that an assistant or someone up the tree has dropped the snake out of the tree. Now this fakery is fraudulent, but it may be scientifically accurate. … [So,] what is the harm? On the one hand, let’s just say it’s scientifically accurate. In other words, snakes do occasionally get chased out of trees and will fall to the ground. So the behavior is accurate. That’s good. But what’s wrong here, I think, is that the audience thinks they’re watching something that happened completely naturally. 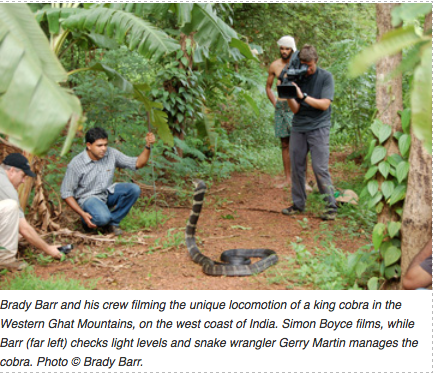 They think the cameraman was patient, waiting days or weeks under the tree for the snake to come out and fall. Of course, we all know that doesn't happen. It was all staged and done in a couple of hours. I think what’s wrong is that the audience is deceived. Well, does that matter? Maybe not. Some people would say, "Stop fussing. This is just filmmaking. This is just natural, ordinary, banal filmmaker artifice.” I would ask the question: when did that artifice cross an ethical line into unacceptable audience deception? I think it does happen too much. I agree that equally moral people will draw that line in different places. The point of my book Shooting in the Wild is to push that line back a bit so that we are leaning more towards more transparency and less towards more deception. Laurel Neme: Could that audience deception also backfire in terms of people thinking it’s a lot easier to see wildlife close up? Laurel Neme: Another aspect of the audience deception is the idea of staging the animal fights and consistently depicting certain types of animals, like sharks, as murderous and evil. What is the impact of that? Chris Palmer: It’s not good. 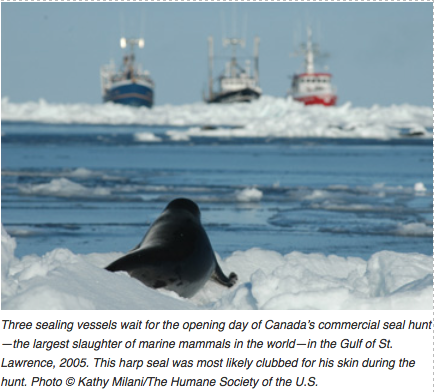 As you know, America and other countries go to United Nations meetings like CITES [the Convention on International Trade in Endangered Species] to try to protect endangered species, animals like sharks, bluefin tuna and polar bears. We've been amazed how difficult that is. You'd think it would be fairly simple to get parts of the world to unite to protect sharks, [especially] with shark populations plummeting so severely. But we find it hard. We get outvoted. Why is that? Why isn't there more public support for this? I think one reason is programs like Shark Week demonize sharks, and so when our representatives go to CITES to try and persuade them to protect sharks, there's not enough public support. People generally think: "sharks are dangerous, they’re menacing, we should get rid of them." And so, while Shark Week does have some good programs and is run by very good people who mean well, in their drive to get ratings, they show sharks as dangerous man-eating monsters. And this is not good. I'm not saying every program is like that on Shark Week, but for the most part [they are]. The reason that it gets high ratings, the reason that key demographic males ages 21 to 36 tune is, is that they want to see mayhem and murder and blood and attacks. It is in the commercial interest of the network to promote Shark Week as showing exciting, dramatic, dangerous pictures and stories about sharks. This is not good. We need to have more programs that show the true nature of sharks. We now know we can swim outside shark cages with Great Whites without any trouble at all. We know sharks are far less dangerous than we used to think, even the so-called dangerous sharks like Bull sharks and Great Whites and Tiger sharks, that have been know to attack people. Most shark species do not attack. There are three or four [species] like Bull sharks that have a reputation for being dangerous, but we know that, even with those sharks, you can swim with them now quite safely outside shark cages. So, these animals are not as dangerous as you've been led to believe by Shark Week, and I think Discovery has a responsibility and they know this too. They’re trying to balance the desire to promote conservation with the desire to get high ratings. But I think Discovery needs to lean its weight more towards conservation and portraying animals in an accurate responsible scientific way. Ben Kennedy: Where should filmmakers draw the line? How can they balance getting the money shot and doing the work ethically? Laurel Neme: What can people do about this? Tell me about the campaign you’ve started among filmmakers. Chris Palmer: There are several things we can do. One thing we can do is [when a] network, like Animal Planet or National Geographic, commissions a film, they need to find out exactly how the film will be made. When the filmmaker says in the treatment [description of what will be filmed], “we're going to have a close-up shot in here of a lynx,” instead of just letting it go and taking it for granted, the network needs to ask for full disclosure. They need to ask the filmmaker: "How will you get that close-up of the lynx?" If the filmmaker admits "I'm actually going to rent a lynx from a game farm,” then the network has a responsibility to check that the game farm is run humanely (which is very unlikely). … At that point [they could] say "no, we're not accepting that and you need to find that shot some other way." I think full disclosure during pre-production, before we start shooting, will help a lot. Another thing is working with reputable, good scientists who are conscious of animal welfare. …[That] is a good thing. 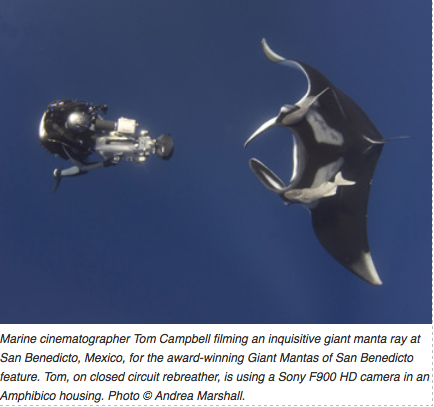 I think another point is to make films about conservation that are entertaining. We can't be dull. We can't be mundane. We can't be lecturing. We can't be hyperbolic. We have to find ways and challenge ourselves to produce films about conservation that use legitimate drama, use humor, use inspiration, use other ways to make conservation totally intriguing and fascinating to people. I think another thing is that every time we make a film it has to be part of a campaign. We’ve gone past the point where we can produce films just for the sake of producing a film. We now need to produce films for a bigger purpose than the film itself, in other words to promote conservation. We need to have a social action part of that. We need to produce books that go with it and op-ed pieces and lectures. 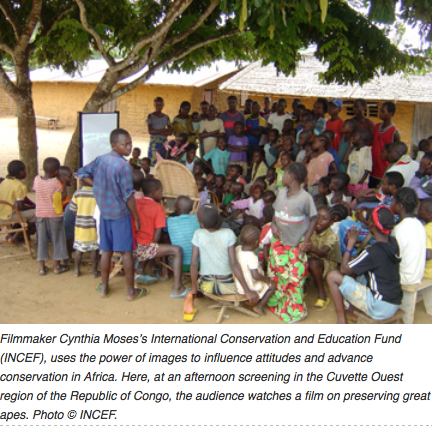 … We need films to be integrated into campaigns so that they really can make a difference. Those are some of the things that we need to do in terms of solving these problems. 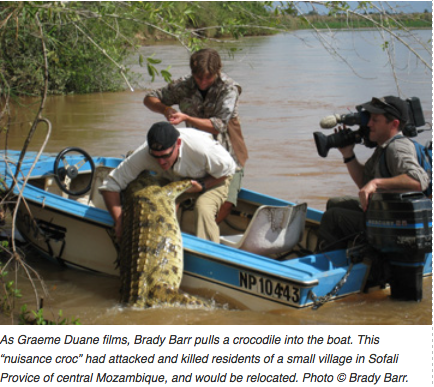 And, of course, improving ethical training of wildlife filmmakers is a very important thing. 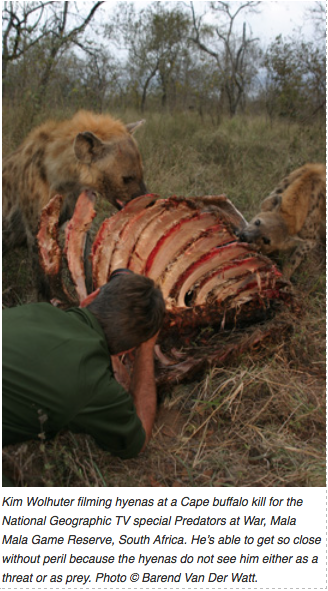 Teaching filmmakers that it is wrong to harm animals, and wrong to deceive audiences, and wrong to omit conservation. Laurel Neme: For someone who simply watches the films, what is their role in helping to promote better films? Chris Palmer: Their role is to be more skeptical. … When they see a grizzly bear and a wolf sparring, fighting over a kill, [they should ask] "I wonder how they got that shot" and write a letter to the networks asking: How did you get that shot? Did you use a controlled bear and wolf to get that shot? And where did they come from? Were they treated humanely? What’s going to happen with the animals once they've passed their life as an on-camera animal? Are they going to be killed? What's going to happen to them? Will they be looked after? Ask these types of questions and don't just accept what you see on television. Write to the networks and demand clarity and disclosure on how these films are made. Laurel Neme: How can viewers use social media to make sure that ethical films rise above the crowd? Chris Palmer: We need to get on the websites of Animal Planet, National Geographic and others and ask them questions. We need to talk to our friends, [via] Facebook and LinkedIn and Twitter. We need to promote the films that are made responsibly. When people watch a great film that they know is made responsibly and has a great conservation message, they need to talk about it and encourage their friends through Facebook to watch it. When they see a film they worry about, [a film where an] animal looks like it was harassed, … they need to ask: how was that done? They need to talk to people, raise questions on Facebook and other social networks sites on how it was done. I think people can use these sites to build a community around this issue of how to produce films that are programs that are done with animal welfare in mind.